The following was compiled and printed by the 1969-70 seventh grade history class of Wellman, Texas as a class project. The other gin known as Pendergrass Gin was actually built by Mr. B. V. Harrison in 1925. Then H. H. Williams became half owner and manager along with Mr. Harrison, who lived at Odonnell, Texas. The gin burned in 1934. 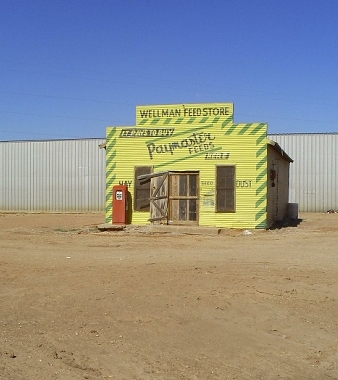 Mr. W. C. Campbell and his daughter, Walsice, bought the site and moved a gin from Oklahoma to Wellman in the spring of 1934. It had four small gin stands, which were wooden, a steam engine, and a wooden press. The gin was given power by burning burrs. In 1946 a Mr. McCoal and Mr. Joe Houton bought it from the Campbells and operated it until the spring of 1955, at which time part interest was sold to Mr. Fred McNabb and his son, Fred, and Joe Sain. The old steam engine and wooden press were torn out and a new building was constructed. In May 1957, J. D. and Virginia Pendergrass bought into the gin with Mr. Fred McNabb. The old stands were torn out and better ones installed. In March 1960, the Pendergrasses bought Mr. McNabb’s share and began to modernize the plant. New gin stands, lint cleaners, automatic humidifier, seed scales, and many new features were added. It is one of the most modern electric gins in Terry County today. In 1976 the Pendergrass gin was purchased by a group of producers and the group created Pendergrass Producers Gin Inc. The group consisted of Roy E. Adams, Royce Adams, S. M. Dill, Darrell Ellis, Rufus W. Dill, Clovis Cline, Ronnie Sullivan, James D. Pendergrass, Barry L. Sims, Donald Hancock, Howard R. Andrews, J. W. Hawkins, Delton Young, R. J. Rowden, Bill Burris, and Jackie Burris. This group continued to won the gin until it was formed into a Co-op gin in 1991. The gin was under the management of Keith Pendergrass. The gin continued to operate under the management of Keith Pendergrass until August 1994. Improvements installed soon after the purchase was for a Redi-Co Module Feeder and a Reynolds Module truck. Many improvements were installed during the seventeen years of Keith’s management. In 1983 a Continental 800 Universal Density Press was installed. This greatly increased the income of the gin in that it received the compression amounts that had previously been paid to the compress. This was approximately $ 8.00 per bale. After the gin put in the Universal Density Press the board decided to build warehouses and store their own cotton. It was decided to build one warehouse the first year and another the second. The gin stored its first bale in 1985. There was enough warehouse storage space for 18,000 bales. In 1987 the gin had decided to undergo a large upgrade. A new overhead cleaning system, gin stands and lint cleaners. The building had to have modifications and the gin was brought up to date with other gins in the area. Gin stands were upgraded and other modifications were made again in 1991 at a cost of $ 750,000. In 1991 the gin was changed from Pendergrass Producers Gin to Southwest Cotton Growers Co-op Inc. The original shareholders remaining from the Pendergrass Producers gin conveyed their interest to the newly formed co-op. These prodecers receiving first preferred stock for their share of the Pendergrass producer's Gin were: Rusty Andrews, Jackie Burris, Oleta Burris, Rickie Burris, Terry Burris, Marvin Crutcher, G. W. Dill, S. M. Dill, Rufus Dill, Tony Dill, Darrell Ellis, GTD Farms, Donald Hancock, Jessie Hartman, James D. Pendergrass, Lewayne Rowden, David Dill, Burke Slaughter, Ronnie Sullivan, Delton Young, and Gomez Inc. The Articles of incorporation were completed and set to be effective July 31, 1991. Burke Slaughter was President Jesse Hartman was vice-president, and Marvin Crutcher was the secretary. Other directors were G. W. Dill, Delton Young, Lewayne Rowden, and Rickie Burris. The shareholders of Pendergrass Producers gin conveyed their interest in the gin assets to Southwest Cotton Growers in the amount of $ 558,486.00. Each full share had a value of $ 29,394.00. This was issued as first preferred stock in Southwest Cotton Growers Inc.
Keith Pendergrass continued as manager until August 1994. Jerry Webb was hired to manage the gin in September 1994. Jerry had previously been managing a gin in the coastal bend area of Texas. Several changes and modifications happened in 1996. The gin put in new 86 inch lint cleaners and 198 Consolidated Cotton Gin stands. These were the largest capacity gin stands available. Only a couple of other gins in the nation had these stands. Lint cleaners were installed that would handle the additional volume of cotton which would be upwards of 38 bales an hour. Additional pumps were added to the press to increase the speed of tying out the bales. A massive dirt and trash handling system was installed to handle the addition volume and cut down on emissions. Total cost of the upgrade and modifications was $ 750,000.00. The gin retired that debt some five months later and has remained debt free for eleven years. In 2001 the gin put in a stationary module feeder and modified the press to a doorless press at a cost of $ 425,000.00. The gin had enough in reserve to pay cash for these modifications. In 2004 the gin processed 56,740 bales, in 2005 it processed 54,300 bales, and in 2006 it processed 42,000 bales. The gin is one of the nicer gins on the south plains and will make all efforts to remain so. In April of 2006 the gin started construction of a new office. The office will be around 3500 square feet and have all of the latest computer and electronics available. After 19 great ginning seasons as the gin manager Jerry Webb retired December 31, 2012. In the 19 years as manager Jerry has made the gin one of the top performing gins in the country. Kenny Underwood was hired to manage the gin as of January 1, 2013 and will continue the standard of excellence that Jerry has set for the gin.